Bravo, encore and much credits to Ata Te Kanawa and Rex Turnbull, co-founders of Miromoda, for another successful year. 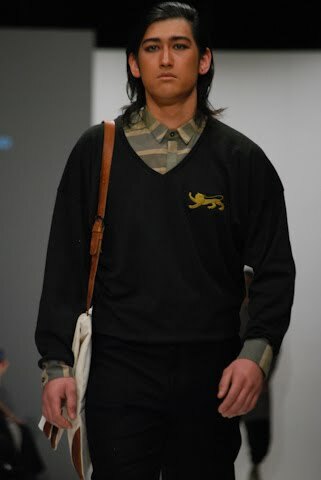 For those who aren’t aware of Miromoda its modus operandi, it is a competition for aspiring New Zealand designers (with Maori ties) and has a similar philosophy to that of ‘Project Runway’. Miromoda (Miro – The technical word for the twinning of fibre in Maori and Moda – Italian for fashion) when pronounced correctly, is tonal in Maori but has an international awareness about it. So this year exhibits seven designers with collections that are of a high calibre. 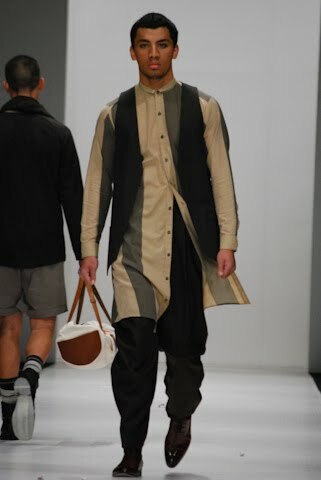 Starting off the show was Aroha Wikotu, who won the ‘Established Designer’ section. 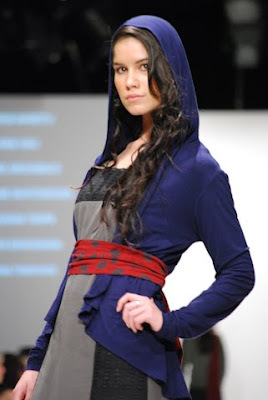 Her label – Shikoba, meaning feather in American Indian – prides in clothes that speak to an audience that are keen on organic and natural textiles and techniques. Aroha based her latest collection on shapes that are forgiving and colours that are earthy with the exception of reds and purple-mauves. An urban scope of grey wool-mix tunics, dresses with ties and hooded cropped shawls. Felt accents with perforations adorn shoulder yolks and appliqué add to the cleverly detailed work that Wikotu is known for. Smart layering of merino polo necks pair wonderfully with dresses, skilfully tailored jackets help brave the winter chill in style. Prints are nostalgic of the native flora; pohutakawa flowers, flax stems and fantails. All together, this is the consummate collection of a notable designer that also knows what women want. Ana Hau – winner of the ‘Haute Couture’ section – acquired a lot of positive attention during her showcase. The first to demonstrate the them of Asian fusion (seen widely throughout this collection) was a brilliantly structured kimono with feathers that trailed down the edge of one lapel, held cinched at the waist with a wide, woven detailed obi belt. Orient influences ran rife with stunning fabrics; toggle details and technical cuts are tailored to perfection – especially a dress that was made of a sequined fabric that outlined a multitude of sheer circles. Grace Hobson led the finale in a stunning floor-length dress with an incredible lattice framed wings that would look flawless in a Victoria’s Secret show. Blaire Archibald (a Designer Direction contributor that oversees menswear trends) is the ‘Overall and Emerging Designer Winner’ and named his collection – Matua. 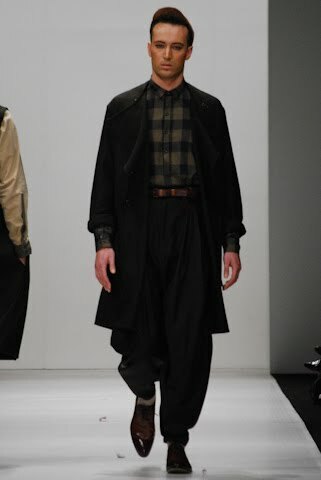 His theme has a retrospective angle that takes colours and cuts of the 1940’s and interprets into menswear that is modern and fresh. Shirts have a quirky take on exaggerated hem lengths with contrast colours of olives mixed with creams, beiges and collar-stands are a tidy and proper. Woollens have that aged appeal. A sweater that I would like to point out had an embroidered lion on it (below) is one that I could see myself adding to my own wardrobe. Trousers had a plus-four swagger about them, and paired seamlessly with cowl neck knitted tops. Compliments to Blaire and best wishes – for this was a charismatic collection shrouded dusky neutral tones that had a charming boyish attraction to it. Keep an eye out for part two in our two part series reviewing the designer collections from Miromoda. Part two includes designers; Amber Bridgman, Kereama Taepa, Shona Tawhiao and Adrienne Whitewood.